One of the passengers aboard the plane was a high school special education teacher from Georgia, local media reported. Rough seas and blowing winds have forced postponement of salvage operations to recover the fuselage of a twin-engine plane that crashed over the weekend off Quogue, killing three people, officials said Monday. Authorities here have identified only one victim, pilot Munidat "Raj" Persaud of Waterbury, Connecticut. But a Georgia school district said one of its high school special education teachers also perished in the crash, according to local media. Officials at the McDuffie County school district told local reporters that Jennifer Landrum had been on the plane. The second passenger has not been identified. The twin-engine Piper PA-34 was headed from Connecticut to Charleston, South Carolina, when it crashed Saturday in about 20 feet of water south of Quogue. Authorities hope the wreckage will yield clues on the cause of the crash, but weather has delayed visual examination of the fuselage. The Federal Aviation Administration and the National Transportation Safety Board are investigating. A gale warning was in effect around Long Island until 6 a.m. Tuesday, with gusts of up to 40 mph predicted, the National Weather Service said. "It's blowing pretty hard," Quogue Police Chief Christopher Isola, who helped lead a multiagency search-and-recovery effort, said Monday. "If you can imagine the ocean, which was relatively calm yesterday, it's whitecaps." He said raising the fuselage, found Sunday about a mile offshore in 20 to 25 feet of water, may not be possible in the next several days due to weather. Another large piece of the plane was recovered over the weekend and is in the custody of the FAA, the chief said. He said he did not know what part of the plane was retrieved, but another search leader said it was part of a wing. The body of Persaud, 41, the plane's owner, was found shortly after the crash, while the bodies of his two passengers were recovered Sunday night. Accounts from witnesses of hearing the engine sputter and seeing the plane break apart in flight have been largely consistent, Isola said. According to the FAA, the Piper was made in 1978, and in July, the plane was recertified for flight. Persaud passed the medical checkup necessary to keep his license as an airline transport pilot, the most advanced category of licenses, according to the FAA. NTSB spokesman Keith Holloway said investigators will look at the maintenance history and age of the aircraft, the pilot's medical history, the structural damage to the Piper and communications with air traffic control. "Those are the things that we're starting to collect and will continue to collect," Holloway said. "We'll also be checking in with the witnesses to see what their accounts were." The wreckage will be examined at a secure location, a task that is expected to take a day, he said. Once that is done, a preliminary report will be issued, he said. Authorities credited coordination among 15-plus agencies, the Coast Guard's calculations of drift patterns, and help from a key witness for precisely and quickly locating the bodies and wreckage. On Sunday morning, six vessels with sonar traveled to the search starting point specified by the Coast Guard and the witness who saw where the fuselage go down, said Sgt. John Andrejack, commanding officer of the Suffolk sheriff's marine patrol and leader of the "sonar strike team" of vessels from various agencies. "The Coast Guard drift calculations and the witness' calculations and memory were so precise that at the starting point," Andrejack said, "some vessels got hits on that exact latitude and longitude." Divers found the bodies and extricated them, a challenging task that took hours and continued after sunset until about 8 p.m. because the bodies were trapped, Isola said, declining to release further details. By Monday, the Coast Guard, Suffolk police, East Hampton Town, state Department of Environmental Conservation, Sea Tow, the National Guard, the Suffolk sheriff's office and other agencies ended their search, but Southampton Town and Quogue police continue to monitor the shorelines. "We continue to sweep the beach for any debris that may wash up," Isola said. "We're not expecting anything but possibly random parts or property that may be pushed onshore by the tide." 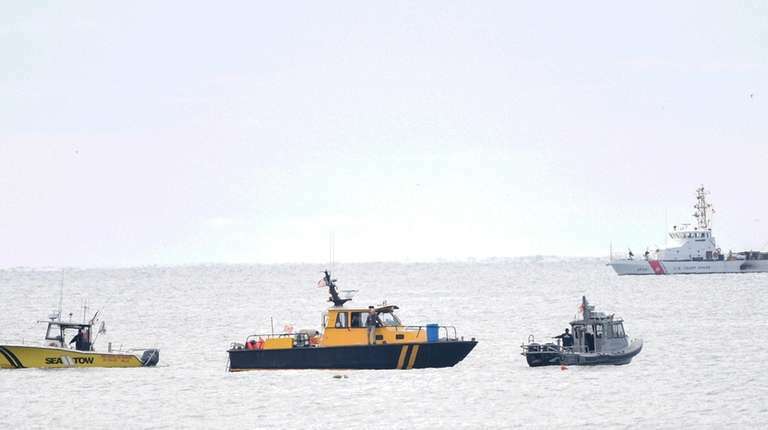 Authorities: 2 more bodies recovered from planeRescue divers have recovered two more bodies from the twin-engine plane that crashed about a mile off the Hamptons coast with three aboard, as authorities determine when they can bring the fuselage to the surface.